You are going to be hearing an awful lot about 'spending this' and 'not spending that' over the next several months from President Obama, Congress and the 'Super Commission' charged with the responsibility to do what Congress should have done for the past decade, truth be told. Achieving 'World Peace' might be an easier objective. We thought you might appreciate the following 'cake charts' as opposed to 'pie charts' since these charts from CBO look like those big birthday cakes you can get at any supermarket nowadays. The only thing missing are the 14.7 trillion candles that represent our collective debt nowadays and 'just won't seem to go out' when you blow on them and hope your wishes come true. It won't be that easy this time around, will it? Nope, it won't. We have already tried to do the 'easy things' to get out of this fiscal jam we are now in and it just did not work, did it? So now the hard work has begun...with the following exception this time around: If our elected politicians don't do the 'hard work' we have elected them to do and make the tough decisions for the betterment of our American Republic, the financial markets have already spoken and told us all that they will make the next decisions for us. The question now is: 'Do we want to make the decisions where we keep control of our future and destiny or do we want to let foreign investors and lenders decide for us what level of interest rates and inflation they are going to force the United States into accepting as a cost for not being fiscally responsible like adults are supposed to be? This is a picture of our total spending out of Washington today. What is the largest part of the federal budget, class? Correct. 'Mandatory. Spending'. What is that anyways? Social Security, Medicare, Medicaid and some other 'entitlement' programs which are presumed to be 'mandated' that anyone who meets the minimum qualifications for each program become eligible for them in perpetuity no matter what. Unless we run out of money to pay for them, let's say. In which case, Congress has every right and duty to go in there and change them so we do have enough money to pay for the 'legitimate' beneficiaries of each program. Congress has regularly changed entitlement benefits and eligibility for decades under a process known as 'budget reconciliation'. We have seen it done dozens of times so don't let any politician fool you into believing these programs can not be touched, amended, modified or improved. Notice the deliberate use of the word 'legitimate'. For the life of us, we can not conceive of one solitary great or even good reason why Warren Buffett or Bill Gates or any other super-rich person on the face of this earth who is a citizen of the United States of America should be 'entitled' to receive one penny from any social welfare program which includes Social Security and Medicare. That was no 'slip-up'. That was the 'truth'. There is no trust fund waiting to be cashed-in for anyone in SS or Medicare. It is all on a 'cash-and-carry basis' meaning what money comes in during the morning in terms of payroll taxes and what we can still borrow from the unsuspecting Chinese lenders (for some odd reason), gets paid out that afternoon in the form of benefit checks to the recipients. We think the government's prime objective should only try to help support those people in dire need of assistance our national welfare programs. People who can afford to take care of themselves should do so and not rely on any federal subsidy in any way, shape or form, including SS and Medicare. 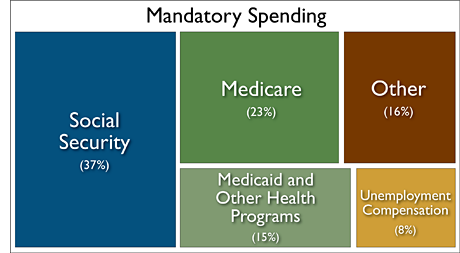 20 years ago, the share of mandatory spending allocated for Medicare was probably half that or around 12% of all entitlement spending. This is where the heart of the problem lies not only in health care but for the entire federal budget deficit dilemma. If overall health care cost inflation could be reduced by approximately 1/2, our budget problems would abate almost overnight. But medical costs have gotten more expensive every year due to a myriad of factors, not the least of which is the fact that more Boomers are becoming senior citizens every single day by the thousands. And when a Boomer gets to be a senior, he or she wants to live the 'good life' just like we have all enjoyed for the bulk of the rest of our relatively pampered lives, save this disastrous economy of the past 4 years now. Think about it: 44 years ago in December 1967, the first heart transplant operation took place in South Africa under the skilled hands of Dr. Christiaan Barnard and the world stood still for a moment and marveled almost as much at that feat of science as when Neil Armstrong and Buzz Aldrin landed on the moon 2 years later on July 21, 1969. A complete heart transplant. It is still amazing to consider being even possible. Nowadays, people go into have double-lung heart transplants; hip and knee replacements and advanced sophisticated cancer and AIDS treatments with a regularity that is almost as mundane as 'watching another space shuttle launch into space'. They are almost as expensive as well. We just ended the space shuttle program mainly for cost reasons. There is no way the American public, especially the aging Boomer Generation is going to give up getting a new knee at age 80 so they can keep playing golf or go hiking into their truly golden years. But tort reform, malpractice insurance reform, defensive medical practices, higher co-pays and deductibles and gauging end-of-life expenses are all going to have to be considered as part of a comprehensive effort to rein in health care costs, all of which the ObamaCare Health Program effort failed to address or even seriously consider. So get ready to dive into all the ramifications of having great health care, far beyond the comprehension of 90% of the world's population really, because we are either going to control the upward cost spiral of health care in America or it is going to control us and take our economic fortunes with it. And if we don't control it willfully and voluntarily via our elected officials in Congress, be prepared to see the Bush Tax Cuts expire on December 31, 2012 and be fully used to cover the cost of unabated health care increases for the rest of your natural-born days. We are first in line when it comes to advocating a complete audit of the DoD budget from top to bottom. There are plenty of defense contracts that siphon money from the taxpayers at large and funnels them to the home districts of Members and Senators who sit on the Defense Appropriations Committee mostly for no other reason than 1) they can write it into law and 2) these contracts provide great high-paying jobs for their constituents 3) even when the military brass doesn't want to use any of the products in the real war theaters around the globe. We are surprised that no one is still making Civil War-era Gatling guns in some district represented by a long-term Member of the House/Senate Armed Services/Defense Appropriations Committee. 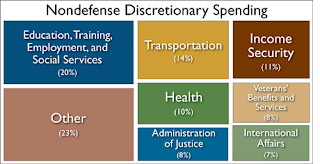 The Joint Strike Fighter has recently come under fire for being a waste of money, mainly because no one in the military wanted it except the Members on Armed Services/Defense Appropriations in whose districts it was being built. Tons of wasteful spending here. Put it all on the table and vote on these programs line-by-line under the hot glare of the C-SPAN lights in the well of the US Congress from now until the end of the year. IV. Next up? 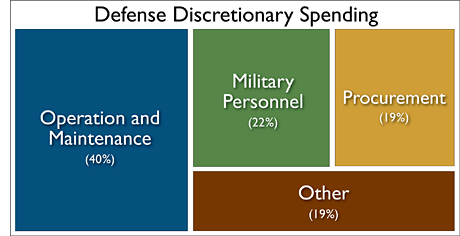 Everything else BUT Defense Spending. 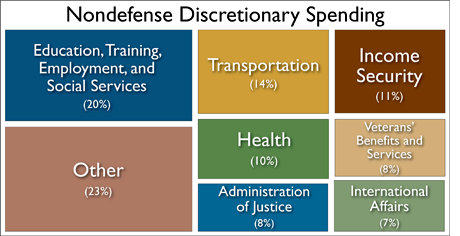 As you can see from the first chart above, non-defense discretionary spending equals almost the size of the entire defense budget. 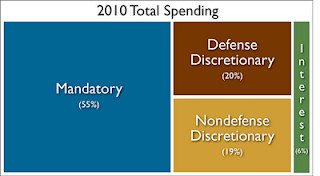 Everything that goes into making sure your food is inspected to building highways and bridges and providing welfare for the poor is included in this very broad category of spending. 2) Public Welfare Programs. We could eliminate benefits to every 'welfare queen' Ronald Reagan spoke about and we would still be over $1.4 trillion in deficit-spending each year. 3) Highway/Rail Projects. We could eliminate most if not all highway transportation projects each year except they are mostly 'paid-for' by gas taxes in each state and sent to the federal government only to have them return some of that money to each state based on a convoluted formula that even we don't fully understand after 30 years of looking at it all. North Carolina, for example, has perhaps the second highest amount of linear paved roads in the Union only behind California. It would seem at some point that every road that needs to be built 'to' somewhere has already been built. Re-surfacing and re-paving of existing highways might be a better use of such funds going forward at far less cost tot he taxpayer. So there you have it. 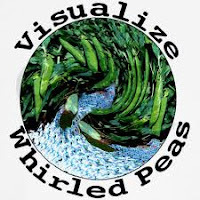 In simple-as-pie charts and colors and graphics and numbers. Go ahead...memorize these facts and figures and emblazon them on your cerebral cortex because you are going to hear some humdinger lies coming forward from all sides once everyone returns to Congress and the Super Commission convenes to do the work Congress and President Obama should have done before they took a break for August. The big money savings are going to have to come from the Big 4, Medicare, Medicaid, Social Security and Defense or else we are in for some more debt downgrades and stock market shocks like you will not believe. How Do 'Real' Jobs Get Created in the Real World?